Barnton Community Nursery and Primary School is a ‘Talk for Writing’ school. We believe that before children can write it they have to be able to say it! In addition to these two dimensions we teach our children to plan, revise and evaluate their writing. Reading feeds our writing. 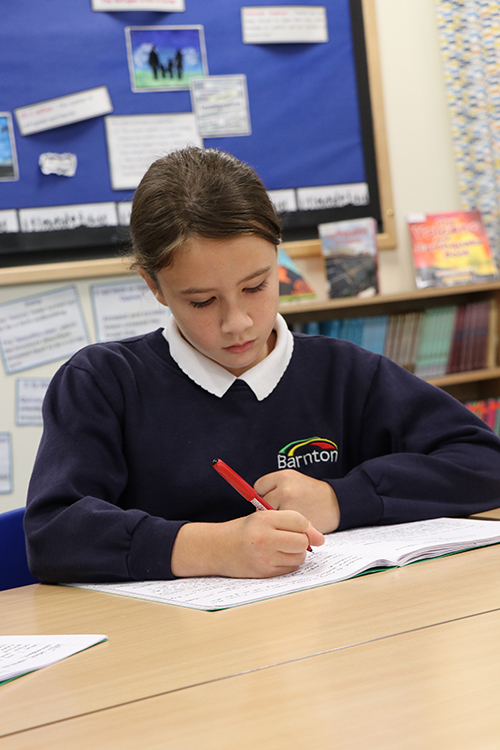 We use a large variety of texts and poems to inspire our children and help them to develop a rich and varied vocabulary. We teach a cursive script from Reception to allow children to become confident in the correct letter formation from an early age. Cursive handwriting has been shown to support better spelling with words learned both by sounding out and as single hand movements. It means that children can be a little slower to write at first. Joining comes naturally to children taught to write cursively. The script is approved by the British Dyslexia Association and so is suitable for children with specific learning difficulties. We know that writing down ideas fluently depends on effective transcription – spelling quickly and accurately through knowing the relationship between sounds and letters. We teach phonics through a range of strategies to suit our children’s individual needs. All children in EYFS and KS1 have a daily Letters and Sounds lesson. Children progress to statutory spelling patterns in KS2 once their phonic knowledge is secure.